Ways to share: Once you've signed up, you can leave a comment on this post and/or use the "Mr. Linky" widget below to link to a blog post(s) about your creative activities during the days of 12/31/12 - 1/6/13. Theme: The (totally optional) theme for December is Celebrate. You can read more about the optional theme here. January's totally optional theme is Dark, which you read more about here. Very excited to join in this year. I have a flicker account that I linked and my blog http://agypsyangel.blogspot.com. I’ve found your yearly challenges so inspirational in the past and although I keep your button posted on my blog I admit I’ve had little time to participate. So this year if I have one resolution it will be to get more involved here. Thanks so much for all you do to inspire Leah ~ here’s wishing you a year filled with inspiration, laughter, and love! 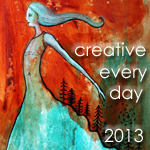 Leah, I love your badge for the 2013 year, and ADORE the art for January’s Dark theme. I’ve been writing about that theme repeatedly this year, but I’m sure it will stick with me in the New Year too. This week’s post is my reflection on the lessons of the 13 moons of 2012 – all on the theme of letting go. This New Year’s will be the most meaningful one yet! And you can bet I will be doing the 2013 CED Challenge! Can’t wait! Happy new year, everyone! I just finished my year of doing process art every day, so celebrating sounds perfect. In 2013, I’m going to broaden the kinds of art I do, including quilting and pine needle basketry. Can’t wait to see what others are up to in the new year! hello all. i am snarling – very pleased to be here with everyone. i am going to be more creative this year and hope to at least flick my creativity 3 or 4 times a week… so cin-cin to a new year! I’m delighted to have found this challenge and I’m joining in! My creative thing for this very first day has been to do a recap on all the textiles pieces I did over the last year on my blog. It takes so long selecting and placing photos, then all the post editing on the blogging software, that it’s both a creative and patience testing process! I plan to post a ‘What I did for the CED challenge’ summary every Monday. For anyone interested, my main focus is textiles – mostly embroidery of many types, but also yarn crafts, but I’m also interested in fine art and design. I loved this theme and working with the imagery ~ thanks so much for the inspiration Leah! I hope to have a chance to create something in paint a little later in the month as well! Looking forward to a wonderfully creative year!! Thanks Leah! Cant wait to get started on this year long challenge and the theme of dark is right up my street.